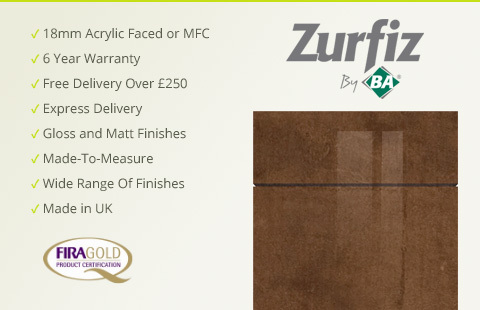 Our range of Zurfiz acrylic kitchen doors or MFC kitchen cupboard doors and drawer fronts offer over 25 colour options, including metallic variations, as well as ultra gloss wood grain finishes and modern durable matt finishes. With doors that are 18mm thick, Zurfiz holds a FIRA Gold award for excellence in furniture and now comes with a 6 year guarantee. You won’t get a better high gloss finish from any other kitchen door on the market. Complete your Zurfiz kitchen with an addition from our range of Zurfiz accessories. If it appears that your kitchen has seen better days, it might be time to consider a kitchen makeover. If your kitchen does not carry the look or style that you want for your home, there are actually a number of options available for a quick and affordable refurbishment that can completely transform the appearance and feel of your kitchen. Many people do not realise that their existing kitchen cabinets can be retained during a kitchen makeover and that by simply purchasing new doors for your kitchen, you can give your kitchen a brand new look for a fraction of the price of an entirely new fitted kitchen. Nearly 90 percent of what is visible when looking at kitchen cabinetry are the doors. By changing your kitchen doors, you can adopt a completely new and modern look. For those looking to make a truly bold statement with an ultra-modern kitchen, consider injecting some colour and style with Zurfiz kitchen doors. The acrylic kitchen doors in the kitchen collection offer a modern and stylish collection of colours to choose from including ultra-gloss and wood finishes. If you would like a classic but contemporary finish, the wood grain high gloss finishes with popular tones are the perfect choice. For a truly dramatic statement, the striped and metallic finishes will not fail to impress. Less Stress: We ensure that whether you're giving your kitchen an entire makeover or simply wanting to fit new doors, our service runs smoothly and professionally at all times. A Timely Makeover: A simple face lift can be completed in just a matter of a day or so, with an entire kitchen refitting taking only marginally longer. Our aim is to have your new kitchen ready for you as soon as possible. Affordable New Look: Our replacement kitchen doors and entire kitchens are reasonably priced and high quality. You can save even more money by installing the doors yourself. Acrylic kitchen doors are equally as stylish as they are practical and affordable. These made to measure kitchen doors and drawer fronts can be seamlessly moulded and offered in a wide range of styles and colours. This makes them an ideal choice for tailoring a kitchen to your personality and design preferences. Acrylic is also easy to clean and maintain with the surface material being incredibly durable and long lasting compared to other commonly used materials on the market. It’s as simple as wiping the smooth surface clean, each and every time. Modern kitchens styled with acrylic doors continue to be one of the hottest design trends this year. With the popularity of this style continuing to rise, the availability has increased and the cost has reduced significantly. The costs are actually quite favourable compared to oak and there is little concern regarding the longevity of the product. The versatility of acrylic allows homeowners to create a modern and stylish look for their kitchen that will not only increase the value of their home but also stand the test of time. With high gloss finishes expected to continue as one of the most popular design trends, these kitchen doors are the ideal choice for replacement or brand new doors for your kitchen. Our collection of made to measure kitchen doors and drawer fronts leaves an ultra-modern impression with their vast range of chic and contemporary colours. Known for their clean lines and resilient surfaces, these doors come with a choice of three distinct edgings. All standard and made to measure doors come with a six year guarantee so that you can purchase with confidence. Each of our acrylic kitchen doors comes with a high quality surface finish. The high gloss finish is intended to be reminiscent of glass. Each door is composed of an 18 millimetre medium-density fibre board that has undergone a cold lamination process to eliminate any heat problems that could result in changes in composition. The end result is a beautiful acrylic door for the room with an incredibly smooth finish that looks just like glass. As acrylic is completely waterproof, you can rest assured knowing that your kitchen is protected from splashes and spills. The acrylic finish does not fade, outperforming lacquered surfaces. With fourteen different colour options, our range of acrylic doors offers plenty of selection to suit all tastes and styles. Inspired by landscapes around the world, there is a wide array of choice from the solid colour styles of New York to the ultra gloss finishes of Italy and the traditional wood grains of Japan. Make a bold statement with the four fantasy styles that can be selected in a metallic or textured finish. We also have a full range of accessories including matching and contrasting end panels to provide your kitchen with a complete look. The Zurfiz collection of colours comes with a choice of three unique edges. Choose from a brushed steel effect edge, a three-dimensional glass effect edge, or a self-coloured edge. The three-dimensional glass edge creates a deceptively real impression while the self-coloured edge creates the illusion of a solid acrylic door. Our doors are made to measure with an impressively short turn around. Home owners can create the look of a completely coordinated kitchen by pairing the replacement kitchen doors alongside the range of accessories that includes bi-fold doors, end panels, handles, plinth, curved doors, and edging tape among many other choices to put on just the right finishing touches. Acrylic kitchen doors are suited to all tough environments including kitchens, bedrooms, and bathrooms. These kitchen doors are equally as durable as they are stylish. Regardless of which trendy colours and styles that you select, our kitchen collection promises to leave a lasting impression by redefining the standard of quality and style in your kitchen. All Zurfiz replacement kitchen doors offer a choice of edging including brushed steel effect, glass effect or matching. Inset kitchen handles are also an option in this range, see product pages for more information on these. The Zurfiz kitchen door range is available in standard and made to measure sizes. See our Zurfiz accessory section for plinths, end panels, curved doors, curved carcasses and curved plinths.